Hundreds attend funeral of Religious Services Minister who passed away at the age of 64. Religious Services Minister David Azoulay, who passed away at the age of 64, was laid to rest on Tuesday evening at the Sanhedria cemetery in Jerusalem. Azoulay, who passed away after a lengthy battle with cancer, is survived by his wife, children and grandchildren. 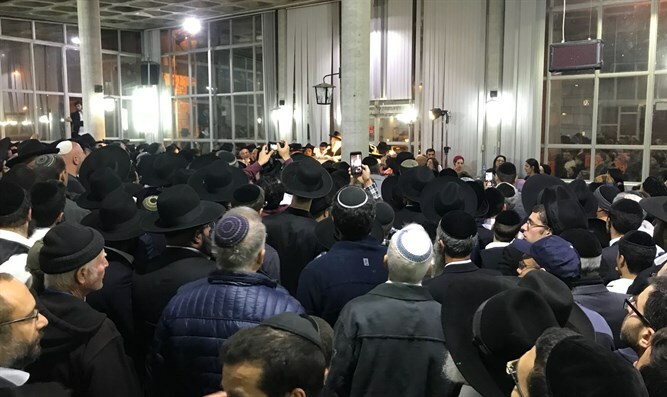 Hundreds of people participated in the funeral, including ministers, Knesset members, police commissioner Roni Alsheikh and many activists from the Shas party, to which Azoulay belonged. At the request of the Azoulay family and in order to facilitate security arrangements, Prime Minister Binyamin Netanyahu did not attend the funeral. The government will convene on Wednesday afternoon for a special session of mourning in Azoulay’s memory. Prime Minister Binyamin Netanyahu eulogized Azoulay earlier on Tuesday. "Today the Government of Israel mourns the passing of our dear friend, Minister David Azoulay. For a lengthy period we prayed for David's recovery as he battled a difficult disease. To our sorrow, his fight for life ended a few hours ago,” said Netanyahu. “For over two decades, David served as an MK and initiated many laws the purpose of which was to benefit the citizens of the state. He was an outstanding and industrious minister who brightened everyone's face; he loved peace and pursued peace. I and the entire government will miss him. We send deep condolences to his wonderful family, including his son Yinon who is following his path as an MK. We will all miss David very much. May his memory be blessed," he added. President Reuven Rivlin said, "I was so saddened by the death of my friend, Religious Affairs Minister David Azoulay. David was one of the most connected politicians to all the tribes of Israel." "A man from Akko who dealt with the needs of the public his entire life alongside endless dedication to his wonderful family. In recent times, he bravely dealt with his illness, but made sure to continue to serve the public as best he can. We shall bear his memory in our hearts," the president added.